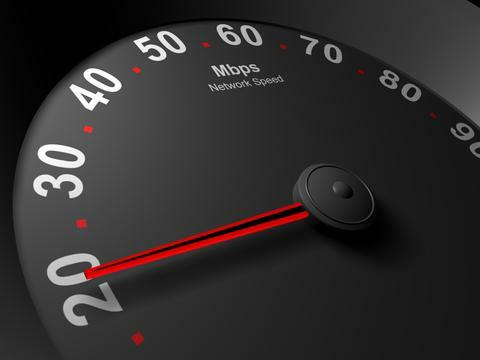 Internet usage has evolved from slow dial-up to fast, efficient speeds. Wireless Internet service is one of the quickest ways to access and navigate through the web. However, this application can be slow due to problems within your home or office. No matter what the problem, there are some quick fixes that will put you back on the road to faster broadband service and a blazing internet connection. Long phone line extensions are commonly used to provide phone jacks for every desk phone throughout the home or office. The interference experienced through these line extensions result in slower internet speeds. This kind of interruption can slow down productivity and cause lots of frustration. Interference from other electronic devices may greatly affect your broadband connection. A simple test can be performed to determine the cause of your slow connection. Start by turning off any electronics in your home, then one by one turn them back on. While performing this test, monitor your connectivity for signs of disturbance. Update your operating system whenever the opportunity presents itself. Most systems let you know when updates are available. Your DSL modem should also be updated to the most recent firmware. Consult your owner’s manual for instructions on modem updating or make a call to your service provider so that they can walk you through the process. If you have a modem that is over two years old, replacement is a viable option. Get one free or at least for a small fee through your ISP. Should you renew your contract, they most often will drop the fee. Switch browsers to experience better browsing. Google Chrome and Mozilla Firefox are the more popular ones; however, there are several available web browsers. A different browser may allow for faster loading. After this process, make sure that your network is secure and protected by password. This keeps unauthorized users from utilizing your service and causing a decrease in bandwidth, which retards your connection speed. Boost your connection speed for free by simply moving closer to your router. Make sure that you have your router as close to the master phone socket as possible. Use the shortest cable you can find to connect your router to the master socket. Tweak your browser settings there are ways to open more connections from your browser to the internet for Firefox and I.E this will give you a nice boost in speed Google tweaking your browser to see the different ways to change the inner setting in your chosen browser. Accelerators there is software you can use to the will make the operating system you are using optimal for your current hardware set up due to the vast number of different hardware setups you can have your OS won’t be set to be as best as can be and smooth running as is possible this can impede on your internet connection speed. In summary, be sure to check your line extensions, keep your system and modems updated, try a new browser, and keep your router as close as possible. These simple tips will get your broadband connection back up to speed. Guest post by: Written by James Helliwell a Tech writer from www.broadbandexpert.com with a passion for broadband technologies and social media. Hope you are all well and enjoy reading my pieces. I had never really thought about it that much. I am interested to see what electronic devices affect my connection. I haven’t use any of those accelerators. I hope you can give me a good one or at least recommend the top 3 or so of those accelerators. Thanks Michael for the tip. Will definitely install that plugin. Yeah, quite a good post, I need to think about it. Actually I have never thought about this. I would like to request you to share us a blog post on this topic “Tweak your Browser Settings”. Tell ya what keeps happening to me, after 1-3 years of prefect operation, the wireless router starts to lose it’s mind. Dropping connections, booting you off, connecting but not accessing the internet. You name it. I’ve seen this happen with the current Dlink router and the LinkSys router before it. I’m about to take this one outside and smash it if I have to reboot it again! I never get the full speed advertised by ISPs and if it is a slow day, just too bad, calling them up is futile as they just provide standard replies. I agree with DJ, an elaboration on how to change the inner settings in our browser will be good. will try some accelerators if they could help. i would have been nicer if provide with some links for the same. I’m going to move my router downstairs and see if it makes a difference. these are great tips that really helps speed up internet connection. Also let me add that you should check the speed of your PC too…. Tweak it for better performance if you want to enjoy the maximum speed in any service ! Is there much difference between the WiFi modules on the May 2011 iMac and iPhone 5? With one of the O2 routers (I think it’s thompson) my iMac keeps having issues with the DNS, while the iphone 5 doesn’t. Thanks for sharing the tips. I’ve a sow wireless internet connection I hope my connection will become faster after following these tips. Excellent article! I never understood why Microsoft has so many settings that limit the efficacy of a wifi connection. I use many tools to help alter these settings, and I wish there was an easier way. Next post: Top 50 passwords you shouldn’t use – and learn how to create a strong password!